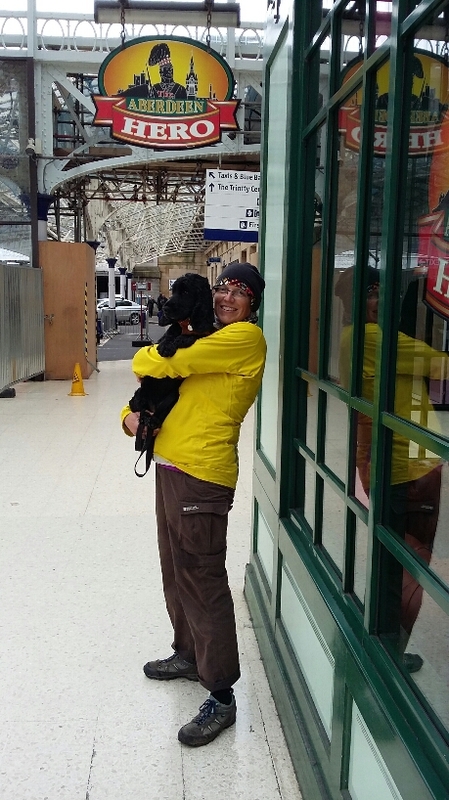 Having left Bury St Edmunds on April 29th with a vague plan to get to Scotland, Raisin and I came to the end of our journey today, in Aberdeen. The weather has been so ‘filthy’ (Great Aunty B’s word coming in handy again) for the past few days that we did the last little leg by car rather than bicycle, but after covering what must be more than 600 miles under pedal power, I hope we can be forgiven for that. Aberdeen looked like the big, busy place it is, with tall grey buildings and wide streets, statues and roadworks, shops and grime. 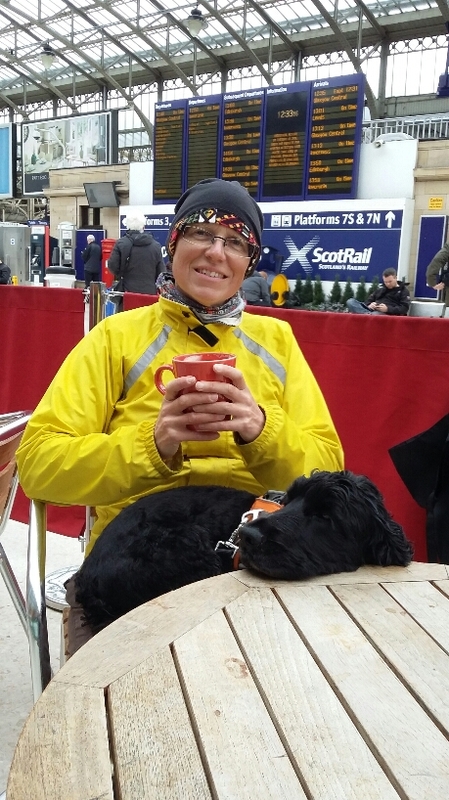 We took shelter from the wind and rain at the railway station, which was quiet despite the tempting train destinations on offer: Inverness, Inverurie, Glasgow, Edinburgh (and Kings Cross). So much still to explore. Another time. Thank you to everyone who has followed this blog and sent kindness and encouragement, which was a completely unexpected but much appreciated part of what has been a wonderful experience. Now, we need to recharge our batteries and see our friends and take some time to appreciate the lovely life we have at home, with a new perspective. All night, listening to the rain hammer our tent, I couldn’t help wondering if Bervie Water (running alongside us all of 5m away) ever burst its banks. The level had risen appreciably during the day; another couple of feet at high tide and we would be under water, the sleep mat a lilo. Cormorants had arrived to fish on the now angry looking and brown river, where before were swans and ducks, adding a sinister edge to the drama (cormorants always remind me of pterodactyls; prehistoric and scarey). 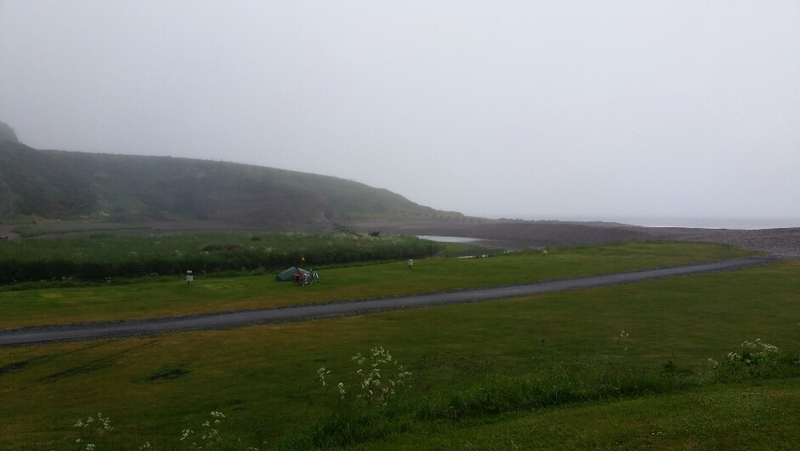 As it was, my friend arrived in the nick of time, when high tide was nearly upon us, and we unceremoniously stuffed bike, trailer, bags and tent – all, as we were too, sopping wet – into the car and headed for the hills. 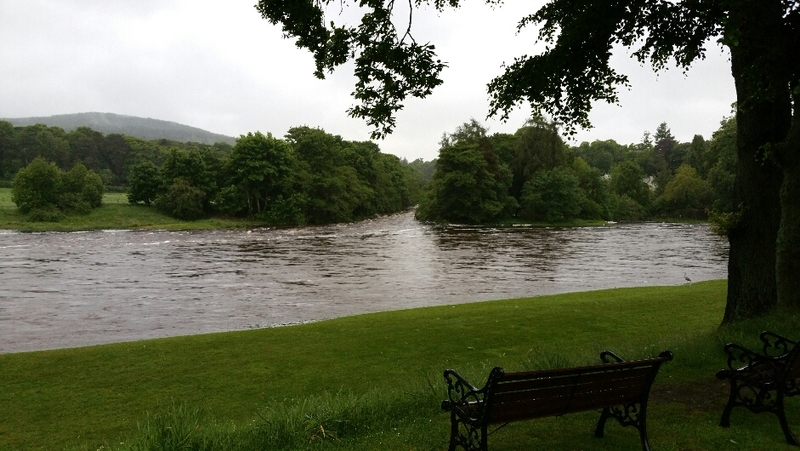 Our hotel in Banchory, a town west of Aberdeen and at the edge of the Cairngorm mountains, is right by the confluence of the Dee and Feugh rivers, both raging torrents, with the bank already breached. From my window I observed an apparently uncomprehending (and presumably hungry) heron, watching the water rush past most of the afternoon. 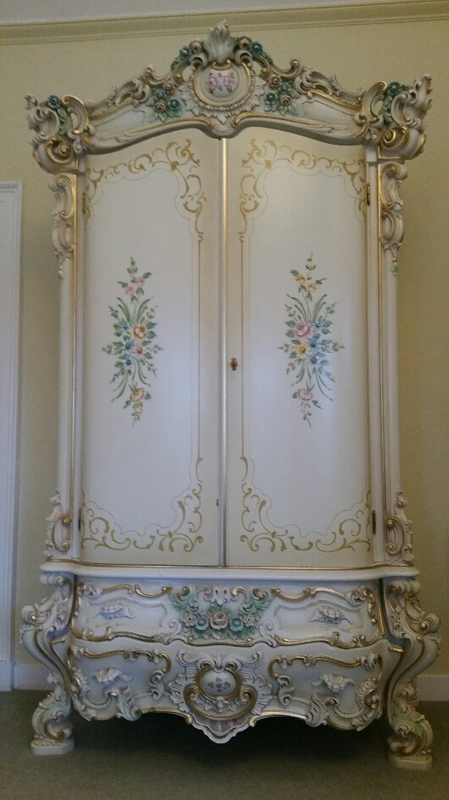 It’s wonderful to be in a warm, dry environment (obligatory bath notwithstanding) and it feels madly luxurious to have a bed, telly, kettle, toilet and a (rather understated) wardrobe. I’m glad it’s a first floor room though, with all that riverage so near and the rain still raining. The hotel does nice food and is dog friendly so we’ve had a good feed. 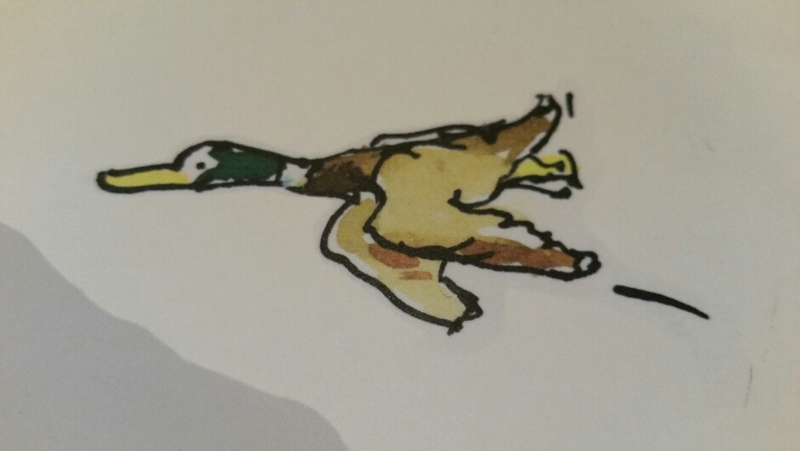 There was a drawing of a mallard on my place mat this evening, a reminder of life before this journey (but that’s another story). Tomorrow the plan is to visit Aberdeen, which will mark the end of this story. If we don’t drown in the meantime. Still in Bervie, awaiting our lift home, the rain pinned us to the tent for most of the day. 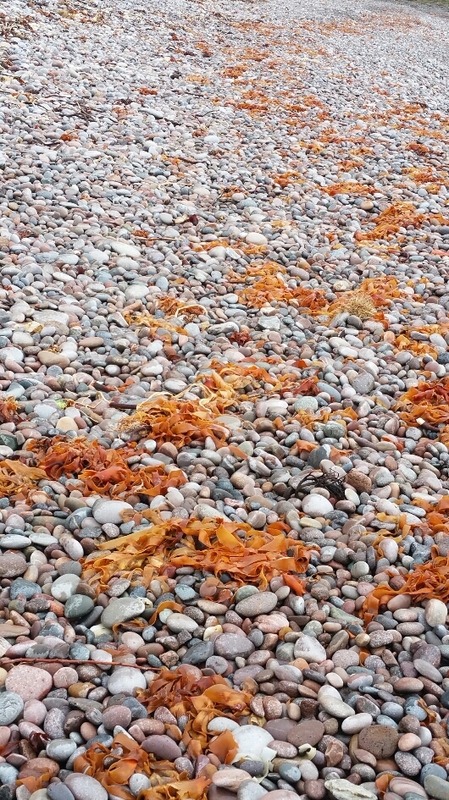 In between deluges we had a look at the sea, to find the beach attractively adorned with orange seaweed. But after a short game of driftwood sticks we were driven back to our little green shelter by another downpour. The wind changed direction in the night, swinging from East to North Westerly and gusting strongly, meaning we heard for the first time the church clock in the high street striking. And also, the tent is taking quite a buffeting. Where the air passed either side of our pointy end before, it’s hitting us amidships now and the effect is rather unsettling, as if we might take off at any minute. 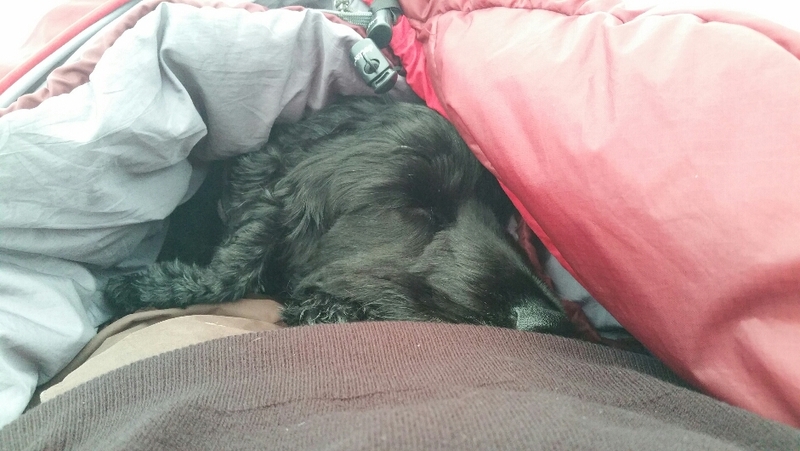 Still, we have remained dry so far, and the sleeping bag has kept us both warm (Raisin loves it, and snuggles so far down inside given half a chance that it’s a wonder she can breathe). If we make it through the night I will be able to say the kit for this trip has worked well. We ventured out for supper at the Bervie Chipper this evening, which was again very pleasant. The rain had turned to fog but the time we finished. 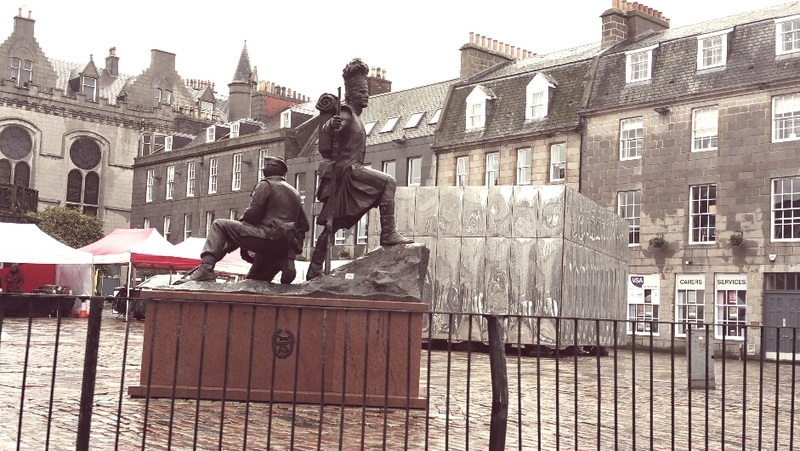 I don’t know if this is how I will remember Scotland – cold and damp. It’s still beautiful here even so, rugged and unspoilt. Oystercatchers are peep-peeping overhead and lambs across the water baa-ing against the constant murmur of the sea. Whatever, the memories will be good and I am so glad we came.